The focus of the CBYC Youth* Learn to Sail program is to teach the fundamentals of sailing in dinghies, with the aim of instilling a life-long love of sailing. 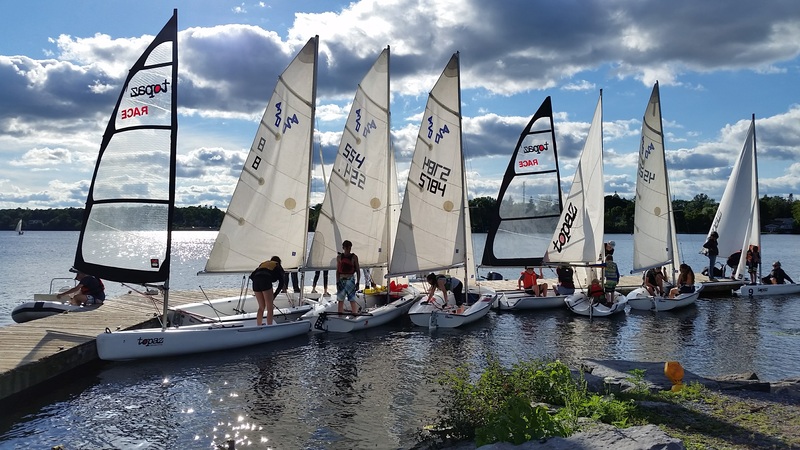 We follow Sail Canada’s CANSail dinghy program, which includes lots of time on the water in a safe, fun and active learning environment. Our instructors have come up through our program as students themselves, and have all had years of training to achieve national certification through Sail Canada. * Our youth program is for ages 8 – 17. If you are an “older” beginner sailor, please see our Adult Programs. *Please note: It usually takes at least two courses of instruction to complete each level. Students must successfully demonstrate all of the required skills prior to completing the level. Weather and wind conditions may limit the amount of on water time available to demonstrate the prescribed skills and is beyond the control of the sailing school. Students are encouraged to sign up for four weeks at a time so as to build on the sailing knowledge needed to achieve each level. 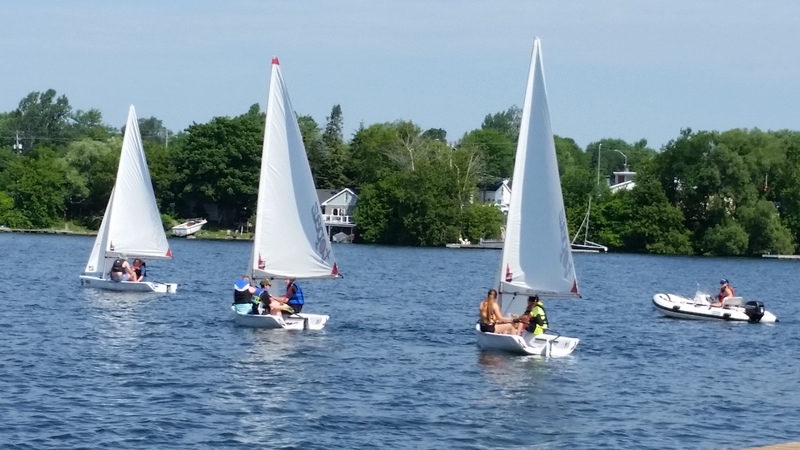 Two-week sessions are offered to accommodate busy summer schedules and for those who are keen to maintain their interest in recreational sailing. (Note: see below for program details). CANSail 5 Single-Handed – $1150 (no HST) per 4 week course New! CBYC Full Members: Any Children or Grandchildren of CBYC Full Members receive a $25 discount (per course). Early Registration: All registrations paid in full by the 1st of May receive a $50 discount (per course). Multiple Registration: All sailors who register for more than one course, and/or families with two or more siblings enrolled, receive a $50 discount off of each course. Collins Bay Yacht Club provides all sailing school students (including families of our youth students) complimentary associate membership in the club for the current season. This will allow students and their families to take part in our club dinghy races on Tuesday evenings, try crewing in keel-boat races, and participate in club social activities. We hope you will take advantage of this to discover the great boating community we have at CBYC and Collins Bay Marina. We strongly encourage registering online to ensure you have the latest course information and dates, and to ensure your personal information is entered correctly and directly into the secure Checklick system. New this year: you can now register online, and pay later by Cheque, Cash, or E-Transfer. Credit Card payment is still available at the time of registration, but we would prefer to avoid the credit card fees and spend the money on sailing school activities and equipment. If you are unfamiliar with Checklick, or unsure how to complete the online registration, we recommend you review our online registration help page prior to proceeding to Checklick. Please note that after registering online, you still need to complete the Youth Medical Information Form, and submit it to the Sailing School Administrator before the start of classes. This form must be completed for every student and received by the CBYC Sailing School before they can participate in any course or other sailing school activity. To register online, click on the Checklick box. The CBYC Checklick storefront should open in a new tab. To register by mail, download and complete the Youth Registration Form, and mail it in with a cheque for fees made payable to CBYC Sailing School (mailing address is on the registration form and available here). Please do NOT mail cash. To register and pay in person by cheque or cash, please contact the School Administrator to make arrangements. Note: space is limited – registration is only confirmed when fees paid in full. Fees for this summer are listed above and on the registration form. The Sailing School operates Monday through Friday from 9 am to 4 pm (including the July 1st Holiday & August Civic Holiday Monday). Students may be dropped off after 8:45 am and picked up until 4:15 pm with supervision provided by our staff during this 15-minute window before and after formal program hours. Supervised, extended hours are available from 8:00 am to 5:00 pm. The cost is $50 per week. Please contact the Sailing School Administrator directly to arrange extended hours of supervision for your child(ren). Should you need extended hours beyond the 8 am to 5 pm window, alternate hours will be considered on an individual basis. Arrangements should be made through the Sailing School Administrator. Please do not leave your child unattended at the Sailing School facilities or on the Collins Bay Marina property. CANSail 1 is beginner level – no experience required. Supervision is provided both ashore and on the water by our Sail-Canada certified instructors. Using our Topper Topaz 14′ Dinghies, our instructors take each student through the basics of sailing, including rigging a boat, points of sail, rules of the water and general sailing safety. We ensure that the ratio of instructors to students exceeds the national and provincial guidelines. CANSail 2 completes basic double-handed skills and knowledge, with more emphasis on skippering the boat, trimming the sails to maximize speed and control. Like most sailing schools, CBYC firmly believes students learn best from hands-on instruction. For our CANSail 1&2 courses, we have three or four students in a boat rotating through the various tasks involved with sailing a boat. And while we try to maximize time on the water, there is also lots of time for games and other fun activities. It is mandatory for all students to wear life jackets while on the water. Nonetheless, good swimming ability and no fear of the water is required. 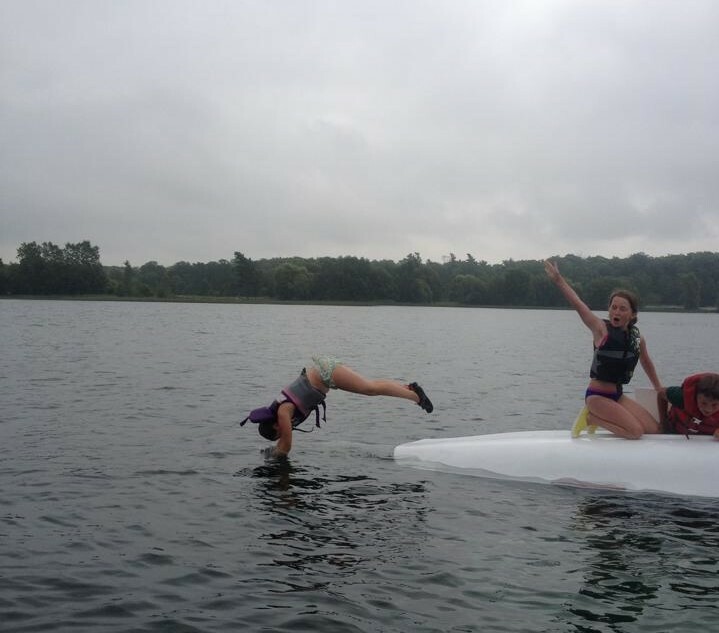 Part of the program is dumping the boat and learning how to right it again. CANSail 3&4 covers more advanced sailing skills. Students must be certified CANSail 2. Using our Club 420s (the preferred training boat for the CANSail 3&4 level) students focus on sailing in stronger winds, sailing theory, handling and use of spinnakers, and introduction to tactics. For CANSail 3&4 the norm is two students per boat as sailors work on the teamwork required in double-handed racing. CANSail 5 is a Learn-to-Race program which fully integrates boat handling with tactics and strategy. Sailors are also introduced to rig tuning and its relation to boat trim and conditions. Students must have completed CANSail 4. Minimum age is 11. Maximum age for youth programs is 17. 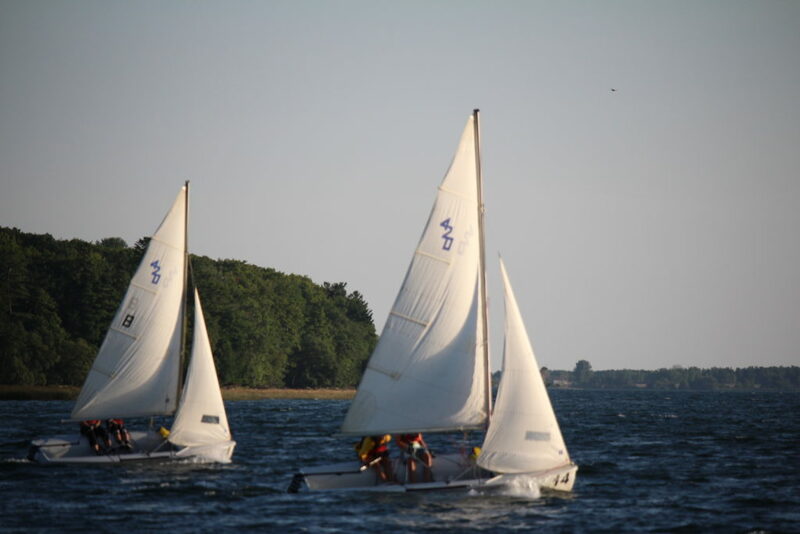 Classes are taught using Laser Radial (single-handed), or Club 420 dinghies (double-handed). CBYC Sailing School can provide a limited number of 420s for double-handed students. Single-handed students must supply their own Laser Radial. 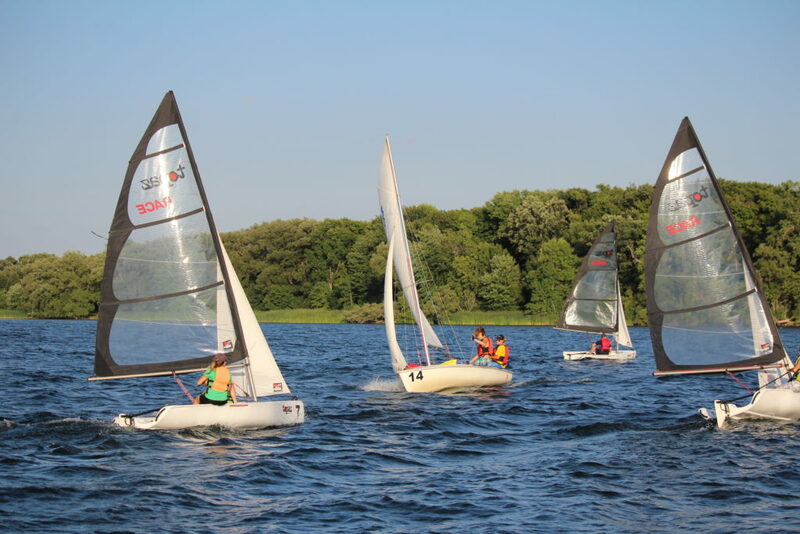 CANSail 5 Students will also be expected to participate in at least one local / area regatta, which will require parental support to assist with the transportation of boats and supervision of students (while ashore) at regattas. If you need any further information, or have any questions, please do not hesitate to contact the School Director or Administrator.